Helianthus salicifolius "Willow Leaf Sunflower"
BIG, LOW MAINTENANCE & EASY to grow, this Midwestern native sunflower provides profuse late Summer thru Fall bloom & unusual, graceful foliage. It will get big (not invasive but ever-spreading outward). 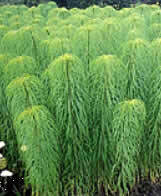 Depending on the richness of your soil, it will grow 4’ to 8’ tall but is not fussy about soil at all. The unusual, willow-like leaves surround the vertical stems, helping to make it a stunning vertical accent. 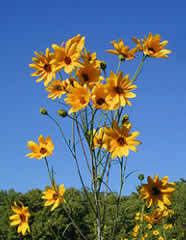 The 2” - 2.5” bright golden blooms have dark centers & sway beautifully atop the stalks. A great back of border focal plant & often used as a quick screen or hedge. To control its height, cut back by half in June.